JOHANNESBURG, 5 March 2013 (IRIN) - Contrary to popular belief, most rural communities facing recurrent climate shocks learn to adapt, using their own resources and knowledge. Yet many international aid programmes have outside “experts” craft interventions without the involvement of those they seek to help. But a handful of NGOs is asking communities what they need to better adapt to changing environmental and climatic conditions. Such initiatives seek practical ways to implement resilience while taking into account the strengths, coping mechanisms and ideas of the people they intend to assist. One such initiative is Partners for Resilience (PfR), a collaboration of CARE Netherlands, Cordaid, the Netherlands Red Cross, the Red Cross/Red Crescent Climate Centre, Wetlands International and 30 civil society partners in the global South. Established in 2011, PfR works in nine countries in Africa, Asia and Central America. "If you want to help people be able to deal with change, then you have to start by thinking about them as people who have their own minds and preferences and plans, and the right to choose"
Based on its interactions with local communities, local and national government representatives, and other partners, the initiative has drawn up a list of minimum standards to help local actors reduce climate-related disaster risks. The list “does not aim for impossibly idealized solutions but for practical approaches that are achievable by communities with relatively limited support”, explained Maarten van Aalst, head of the Red Cross/Red Crescent Climate Centre. At the very least, the minimum standards say, a community must: be aware that future climate risks will be different from today’s; be able to interpret early warnings about possible climatic shocks and use them in local adaptation; be able to conduct and update risk assessments; and identify ways to adapt or change existing livelihoods. The community should also have relationships with meteorological agencies, and be able communicate their needs to government and climate change-related officials. In 2009, another group of NGOs - including Oxfam, Care International, Save the Children, World Vision International and ODI - formed the Africa Climate Change Resilience Alliance (ACCRA) to explore how development interventions could improve people’s adaptive capacity. ACCRA works to understand communities’ mindsets before determining interventions. It studies how they cope with shocks, their local institutional arrangements and their power relations, and it explores the social networks they rely on for support. ACCRA also tries to engage communities on issues beyond just climate change-related shocks and disasters, considering long-term trends like rising food prices, increasing temperatures and population growth - issues that require flexible and forward-looking decision-making. For example, ACCRA has partnered with the Red Cross/Red Crescent Climate Centre, the firm Abaci and Antidote Games to develop a game to encourage locals to make flexible and forward-looking decisions in response to real-world climate-change scenarios. The game is being used in research workshops in Ethiopia, Mozambique and Uganda. “Ours is more [a method] of empowering existing institutions with evidence and knowledge to create a demand-driven approach,” said Saskia Daggett, a coordinator at ACCRA. Since its inception, ACCRA has gathered evidence from its experiences in three countries - Ethiopia, Mozambique and Uganda - which it hopes will inform the work of other aid actors. ACCRA’s strategy seems to be working. Based on feedback from the populations of two districts in Uganda, ACCRA has managed to foster constructive relationships with communities and various tiers of government. Responding to the districts’ requests for climate information, ACCRA brought in meteorologists to explain forecasts and climate data. By creating connections between several government structures, ACCRA helped the officials communicate this information to the public. This included translating early warnings about possible poor rains into several local languages, then disseminating the warnings through radio, television and pamphlets. As a result, the communities were better able to prepare for the poor rains. Since they had already developed a positive relationship with their local governments, they were able to effectively communicate their needs, which included water points, planting trees and improved seeds. With the useful and timely feedback of the community, the district officials, in turn, were able to produce response plans and to source funds for government action, says Daggett. Now, other districts want to emulate these efforts. “There is much better interplay and understanding between the communities and all the government actors and NGOs,” Daggett said. Still, governments and NGOs continue to rely on short-term, reactive planning, she added. 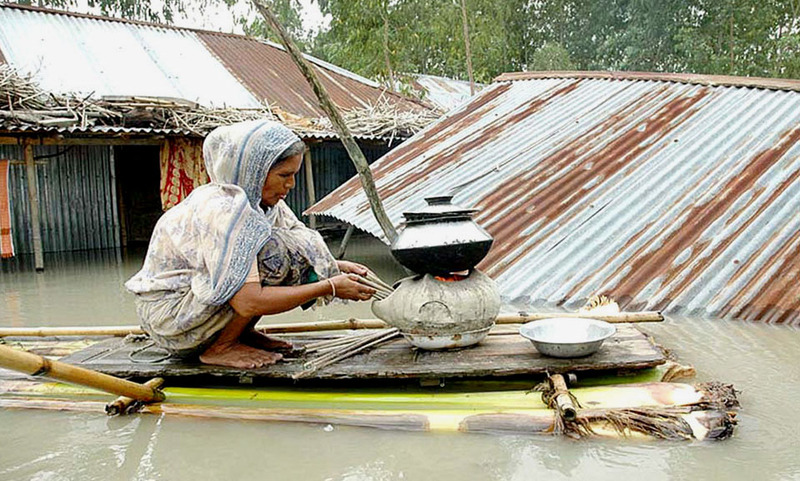 And some communities’ traditions can inhibit disaster prevention and climate-change adaptation. ACCRA discovered that, in some villages in Ethiopia, innovation "was clearly constrained by a dominant culture that frowned on doing things differently… There was strong opposition to individuals changing sowing dates", for example, as the rainfall patterns changed. This is where development actors can step in and support those who dare to innovate. The message of these new initiatives is, as one ACCRA paper put it, "All development interventions need an agency lens, ie, they need to be thought of not simply as delivering a given infrastructure or technology, but as vehicles for expanding people’s range of choices."